Chances are, you can find pizza in our kitchen one or two nights every single week. Mr. How Sweet just can’t go a few days without it. It’s the one meal that doesn’t need the presence of chicken or steak to be deemed a “meal” by him. He claims that pepperoni is enough. Oh, and sometimes we have bacon on our pizza. I guess he kinda knows me. So, I’m always looking for new pizza-like foods. Unfortunately, these still didn’t count as real pizza for Mr. How Sweet, which meant we had pizza the next night anyway. But that doesn’t mean they weren’t tasty! In case you’re wondering, I did try these with sweet potatoes since we loved them so much. They were good too. Not as pretty, but they definitely worked. However, I’d much rather stuff my sweet potato with brown sugar, cinnamon, caramel, marshmallows and bacon. Who wouldn’t? The best part about these treats is that you can make multiple flavors all at once. That’s perfect for me since we all know I get bored easily and change my mind every 6 seconds. I loaded on pepperoni and sausage for Mr. How Sweet and made some with fresh mozzarella, tomatoes and fresh basil for myself. That basil was worth the leg I paid for it with. I’m even thinking that a chicken + broccoli + bacon alfredo combination would hit the spot and a good way for me to eat some greens? Even though I’d rather chew nails than eat broccoli. Even those little green pepper specks up there are enough to spin me into a tizzy. 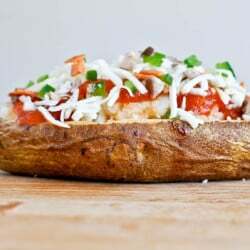 Poke holes in potatoes with a fork and bake for about 40-45 minutes. Remove from the oven and let cool. Once cool, slice around the inside of the potato and scoop out the flesh, be careful not to poke holes in the bottom (it’s okay if you do – it happens!). Put scooped potatoes in a bowl and mix with 1/2 cup mozzarella and 2 tablespoons each of peppers, mushrooms and pepperoni. Mix well. Scoop mixture back into potatoes and spoon pizza sauce over top. Add more toppings and cheese. Bake for 10-15 more minutes. Other pizza flavors you could use: buffalo chicken, bbq chicken, margherita, pierogi, and of course – an array of toppings! Now all I’m craving is a giant dessert sweet potato. Those make a good breakfast, right?